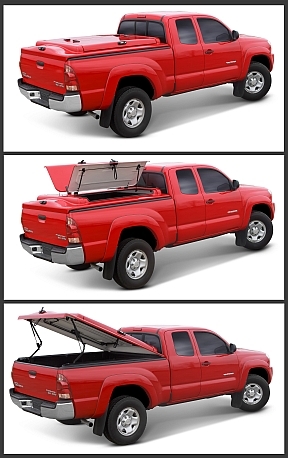 MASSILLON, Ohio – A.R.E.’s Commercial Division is expanding its product line with the new WorkCover LS™, a fiberglass tonneau cover available for 2005 to current Toyota Tacoma standard length bed trucks, starting at $1,450 MSRP. A.R.E.’s WorkCover LS features two doors on each side. Additionally, the entire cover opens effortlessly from the rear of the truck using a hinge system at the front of the cover. Painted to match the vehicle, the WorkCover LS features approximately three extra inches of storage room above the bed rail and its design offers the driver excellent rear visibility from the cab of the truck. Designed to keep products secure and out of sight, A.R.E. offers options such as remote keyless entry and LED strip lighting technology to illuminate the bed. A.R.E. began manufacturing aluminum frame truck caps in 1969 and has become a leading manufacturer of fiberglass truck caps and hard tonneau covers. At its ISO-9001:2008-certified manufacturing facilities, A.R.E.’s more than 700 employees create the products that are sold through a network of more than 650 independent authorized dealers. For more information, contact A.R.E. at 400 Nave Rd. S.E., P.O. Box 1100, Massillon, OH 44648, email fleetsales@4are.com, call 330.232.1757 or visit www.4are.com/fleet.